In one of the paradoxes of polar climate, the heavy westbound ice flow that had closed off the western peninsula seemed to have opened up the normally iced-in Weddell on the east. Uncertain where we would wind up, Brad announced that the next day, the longest day of the year, had been declared our “Expedition Day in the Weddell Sea.” Satellite photos received from the icebreaker Laurence M. Gould (yes, named after my college president) indicated that an opening had appeared in the ice mass blocking the northern entrance to the sea. Beyond that was open water. We would sail through the opening and head south as far as we were able, perhaps even making it to the Antarctic Circle on the longest day of the year. Our passengers cheered at the prospect of becoming a real expeditionary force. We were not the ordinary run of cruise ship passengers. On board we had people of 28 different nationalities with an age range from 13 to over 75 years. Some of us had reserved the cruise months in advance, others were backpackers who showed up in Ushuaia a few days before departure and responded to a bulletin board announcing a few empty bunks on a ship to Antarctica. Our common denominator was a love of adventure. That night we packed into the lounge for a David Attenborough video called “Antarctica – Life in the Freezer.” The most memorable frames from the documentary showed the strange life of the emperor penguin, the only bird to nest deep in the frozen interior, where male penguins incubate their eggs during the Antarctic winter while huddling together to survive the killer cold. We were now entering the realm of the emperor penguin, and Brad had said that with luck we might, we just might see one. In the morning we assembled for an early briefing. 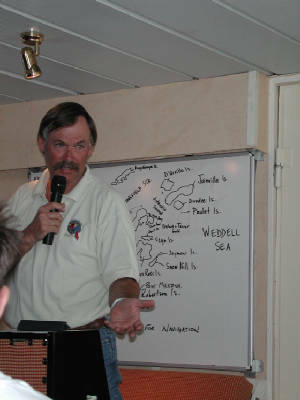 Brad explained that we had reached a point of the Weddell Sea never before visited by passenger ships. We were anchored off the coast of Robertson Island on the edge of the Larsen Ice Shelf. The staff was already going ashore in zodiacs to establish a landing site in a cove that was normally shut in by ice. If all went well we would have an opportunity to set foot on land where no human foot had ever trod. The Canadians made the most of the event. 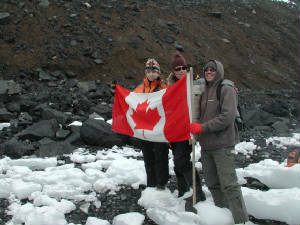 By the time we clambered ashore they had already planted a Canadian flag and christened the place “Point Mikkena” in honor of the daughter of Brook Willis, the expedition’s second-in-command. Point Mikkena was a narrow beach beneath a high rocky ridge with a glacier looming into the sea at one end. The whole area had only recently been covered with ice, for the beach was littered with boulders, scree, and ice chunks like three-foot ice cubes. We walked down the beach past an overhang festooned with icicles toward the point where the glacier was projecting into the bay. As we walked, it actually calved a small iceberg. I heard the loud crack - but alas, I was looking at the path, not the glacier. I quickly tired of clambering over the ice and rocks in my oversize Wellington boots – the prescribed wear for zodiac landings. We returned to the ship for hot bouillon, and an hour reading the news in the Explorer Library (yes, we did have daily news reports giving American, British, Australian, and Canadian versions of world events, all received by radio and printed out nicely for us to read.) The library also offered a selection of fascinating books on natural history and Antarctic exploration – even some novels for anyone with the time and inclination. While we browsed and then ate lunch, the ship sailed on for our second landing of the day, another look at Robertson Island. The second landing on Robertson was at a point better known to scientists, who had visited here to study the marked shrinkage of the Larsen Ice Shelf. 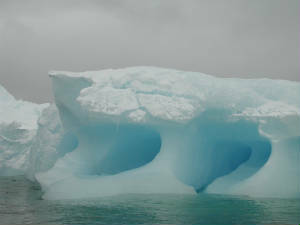 We came in by zodiac through a field of ice floes and small icebergs. The island itself was less interesting to me than the panorama of the bay, where ice debris floated like an extravagant carnival of ice sculpture. With a little imagination there were ice birds, ice dogs, ice trolls, ice cities - many of them colored a gorgeous aquamarine, sometimes with hints of deep lapis. The colors were caused by changes in the ice molecules during years of compression. Now they had broken free and were floating in the bay like enormous gemstones. On the way back to the ship we persuaded Mark, our zodiac captain to give us a detour through the ice fields to admire the color and feel the cold brilliance of the ice. At one point we surprised three penguins lining up to dive from atop an iceberg. They stared down at us with annoyance before waddling off to try the other side. We were still turned south, pressing for the Antarctic Circle. At our evening briefing Brad urged us to spend as much time as possible on deck looking for those emperor penguins. Then, just as we finished dinner, the announcement came that an emperor had actually been sighted off the starboard bow. The captain slowed the ship and generously opened the normally off-limits bow so we could have a closer look. We raced to the front of the ship, and on an iceberg off to the right of us we saw two penguins. The ship had passed the birds, and they were already too far away to see well, much less photograph. Some passengers started to back away with sighs of disappointment, but a crewmember motioned us to stay. To our amazement and gratitude, the ship was actually turning around for a second pass by the iceberg where the penguins were standing. There was only one emperor standing at attention on the ice, but he had obliged us by bringing along an Adelie for size comparison. The emperor was at least three times the size of the other penguin. The ship kept its position as long as possible, but the emperor decided he had had enough of our gawking. He moved away from us as fast as he could, using the interesting penguin technique called tobogganing – sliding on his tummy while propelled by all four limbs, a motion not unlike swimming through the snow. The ship’s log reports that in course of the night the crew sighted 26 emperor penguins – unfortunately at hours when I must have been sleeping.